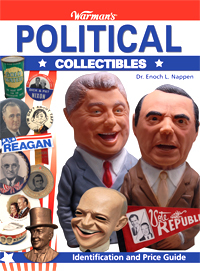 Actual size of book - H 10 3/4" x W 8 1/4"
Warman's Political Collectibles opens the door to the wide world of political campaign memorabilia and economic-social ephemera in an innovative historically and photographically rich approach. Whether you're a seasoned collector looking to expand your antiques and collectibles interests or a beginner with a curiosity of political items of the past, this is the guide to get. Medals, "Coins", Badges & Plaques. Buttons, Tabs, Flashers, Symbolic Items, 1896-1964. Clocks, Lamps & Automotive Items. How to Spot Fakes, Fantasies and Reproductions. Author Dr. Enoch Nappen has long been interested in every variety of presidential campaign memorabilia, a noted expert on the subject of political campaign memorabilia, and a professor of political science.